In the game of sports, we hold moments of silence, the moments to shine over shadow those moments of silence. There was a moment of silence when Miami Marlins pitcher Jose Fernandez passed away. Emilio Macias, 27, and Eduardo Rivero, 25, died two years ago with the 24-year-old ace while aboard his boat called Kaught Looking, which landed upside down on an ocean jetty in Miami Beach. On precisely the 26th birthday of the Marlins pitcher, the families of the two young men who died with him in a late-night boat crash settled their wrongful death lawsuit against the athlete’s estate. The lawsuit was decided by mediation, according to a filing in Miami-Dade County court. The terms of the settlement are confidential, according to the mediator’s report. “It is my hope that the families of Eddie and Emilio can gain some closure on the tragic loss of their sons,” said Christopher Royer, an attorney with the Krupnick Campbell law firm in Fort Lauderdale, who represents the Macias and Rivero estates. Rivero was a salesman at Carnival Cruise Line. Macias was a registered representative at Wells Fargo Advisors. Both men lived in Miami-Dade County, as did Fernandez. An investigation by the Florida Fish & Wildlife Conservation Commission found that Fernandez was in control of his 32-foot center console boat when it crashed Sept. 25, 2016, about 3 a.m. on the north jetty of Government Cut inlet. Officials also said Fernandez was high on cocaine at the time, had a blood alcohol content of .14 and was operating the small craft “while impaired,” in a “reckless manner, at an extremely high rate of speed” at night where there are jetties. Only those three men know what happened that night, they are silenced forever. The Marlins this season have not been making any noise themselves to catch the attention of other major league ball clubs. However, they have started giving out a massive gold chain to the MVP of each game. With gigantic meaning. It made its inaugural appearance after the Marlins 9-3 win over the Atlanta Braves. From a long outfield throw, this is not the first chain in Miami. The Miami Hurricanes introduced the nation to “the turnover chain.” For the Hurricanes football team it is simple. Get a turnover on defense, and the rest is off the chain. 36 inches long and five-and-a-half pounds of 10K gold “Cuban Link drip.” The creator, AJ Machado, a Cutler Bay jeweler known as “A.J. the Jeweler” whose customer list includes hundreds of celebrities. The Hurricanes showed their appreciation for the Marlins’ chain by tweeting a reply to a photo the ball club shared with a comment: “Much respect! #JDF16” along with ‘fist bump’ and ‘hands in prayer’ emojis. The turnover chain made its debut September 2nd vs. Bethune-Cookman when sophomore defensive back Malek Young in the fourth quarter intercepted a pass in the end zone. Young was awarded for his interception. The rest is history to this day. 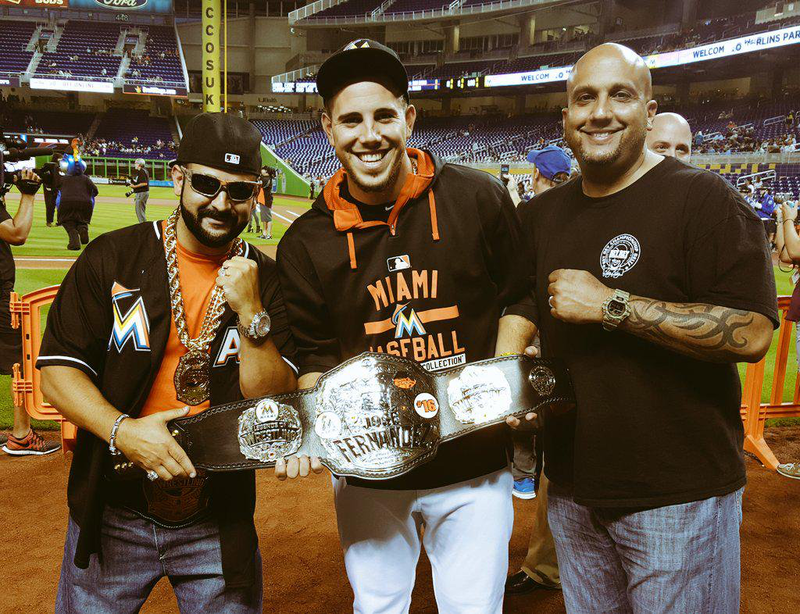 The Marlins name their massive piece of swag, the “JDF16 MVP chain.” Unfortunately, Hurricane fans, the fish’s chain seems to have been a bit larger. As the name suggests, the award is in remembrance of the late Jose Fernandez, and it’s an honor that every player in Miami’s clubhouse takes seriously. “It’s the Jose Fernandez MVP Player of the Game chain,” Castro said. This was another way for the Marlins to continue to honor their fallen former pitcher. The Marlins placed a plaque with the number 16 in black on the wall of one of the support beams of Marlins Park’s retractable roof on the West Plaza outside the stadium before the season. The club removed Fernandez’s locker from the clubhouse that had remained intact with his belongings during the 2017 season and gave his gear to his mother, Maritza. Everything begins with a thought, leading to a brighter idea. Marlins outfielder Cameron Maybin who was part of the Houston Astros World Series Championship a year ago witnessed how the Astros rewarded players after victories with replica wrestling championship belts. Maybin was joyous just from the way it brought together that clubhouse last fall. From there, Maybin got together with his teammates and put a plan into action. Five months later, the Marlins’ “MVP of the game Chain” was born. Hanging from a gold, Cuban link chain around second baseman Castro’s neck after that Tuesday win over the Atlanta Braves was a considerable charm made of solid gold in the shape of the Marlins’ logo displaying the team’s orange, blue, yellow and white. “I’ve been on teams where you win, you lose, and guys just walk in and walk out and go home,” Maybin said. “No, let’s take a second to value this and recognize somebody who was grinding today and helped us get the job done. I got that from guys like Carlos Beltran and Brian McCann. The chain weighs roughly 4.25 pounds. It was created by famed jewelers Rafaello and Co., a group known for fashioning jewelry for numerous celebrities including Jay-Z, Drake and Chris Brown. The company once sold rapper, “Baby,” a $1.5 million watch. Maybin shared he has bought jewelry from the New York-based company before. Maybin and team barber Hugo “Juice” Tandron got in touch with them to have it custom-made. Fernandez, No. 16, was the Marlins’ first-round pick (14th overall) in the 2011 amateur draft. A two-time All-Star, he was the 2013 National League Rookie of the Year. In his four-year career, he had a 38-17 record, and 2.58 earned run average. A toddler named Penelope survives him. Seattle acquired Maybin from the Marlins, giving the Mariners a boost going into the final two months of the regular season. Seattle landed Maybin in exchange for minor league infielder Bryson Brigman and international bonus pool allotment. Maybin was traded a week after the debut of the chain. Moreover, he put a big chunk of the money to purchase the chain. Shine bright in silence, tied with diamonds.